Key control security issues related to tenant keys are an everyday challenge for landlords and management companies. KEYSURE is a key control tool that can improve security for keys in a way thats both economical, worth the effort and, most importantly, eliminates liability and false accusations. The KEYSURE Company offers a unique key control device and system. Their patented product is known as KeyController. Its a pilfer proof, tamper evident physical security container specifically designed for individual keys or other important security items like passwords, alarm codes or personal information that are not accessed on a regular basis. KeyController is the only non-electronic key control product that audits and provides physical accountability for single keys. It prevents false accusations and protects both the giver and holder of the key — a true win-win proposition. HOW IT WORKS: Its a two part plastic box about the size of a deck of cards, a top and a bottom. Both outside surfaces have large labels,similar to the signature surface of your credit card. Both labels receive a signature, description of contents or a number. You sign the box as you would sign your credit card or endorse a check — a simple, well-know security protocol applied to a security product. Simply put the key into the box by snapping both top and bottom together with a snapping sound, which locks the key inside. The key cannot be used or copied without breaking the box. The signatures prevent the key from being transferred to another container. KeyController functions like a security seal. Like a seal, it gets broken and is not reusable. KEYSURE SYSTEM: A 100 unit wall cabinet and a 150 unit drawer are available. For the system to work, create a written security policy describing how the system works and enforced it. The Keysure system involves the tenant in the security of their key left with management. Keysure offers KeyController in four colors, red, blue, yellow and clear. Keys can be color coded in terms of their importance or for different buildings. This is the only key control product designed to physically AUDIT and protect single keys. KeyController is fool proof, inexpensive, user friendly, versatile, portable and can be surface mounted too. LANDLORD IDEAS: This is an ideal product for senior citizens. Include personal, medical, and contact information along with their key. Some tenants may have alarm systems. 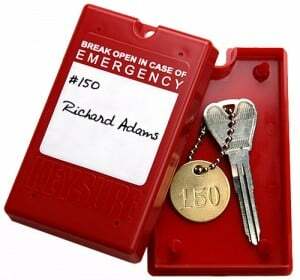 Alarm information can be kept along with the key. You can encourage tenants to leave keys with neighbors with this product. Selling them to individual tenants for personal use is also an option. The KEYSURE system pays for itself over time. The idea is to charge a small fee to cover replacement cost of the box. A user fee also discourages tenants from constantly asking for the key to be let in. KeyController is designed for keys that are not accessed on a regular basis making it ideal for real estate management. The Keysure Company has been in business for more than 20 years. For more information, visit Keysure.net.